Of the BJP chief ministers fighting for a comeback, it’s Vasundhara Raje whose image is the most battered. Can Modi swing it for her? 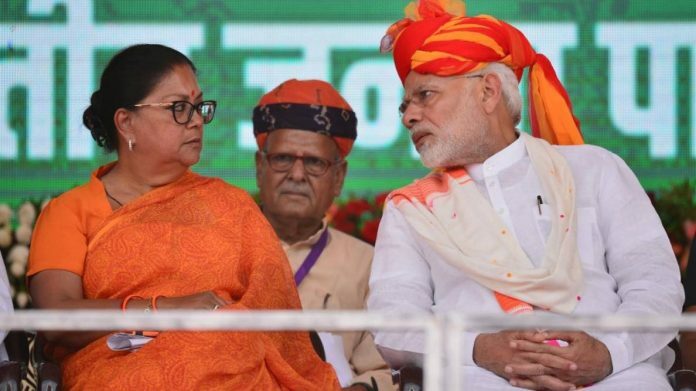 New Delhi: Exit polls in Rajasthan this evening could possibly answer a question everyone has been asking in this desert state: Can Prime Minister Narendra Modi’s popularity override negative sentiments against Chief Minister Vasundhara Raje to get her re-elected? Of the five states that went to polls, Rajasthan is arguably the only one where the chief minister’s unpopularity was in sharp contrast with the goodwill and support for Modi. Exit polls this evening should give an indication of whether people choose to vote Raje out or repose trust in Modi again to set right what they think have gone wrong under her leadership — that is, if these polls get the voting pattern right. The exit polls, like pre-poll surveys, have often got it horribly wrong although comparatively, they have better track records. Unlike her counterparts in Chhattisgarh and Madhya Pradesh — Raman Singh and Shivraj Singh Chouhan — who continued to enjoy personal popularity, notwithstanding the perceived fatigue with the BJP’s long years of rule, Raje’s image appeared to have suffered a battering. Farm distress, unemployment, bad governance, adverse caste chemistry and internal bickering in the BJP seemed to have compounded her problems. The BJP’s core support base that contributed to its historic mandate in 2013 — 162 seats in the 200-member assembly — seemed to be splintering away. A large section of Jats and Rajputs were ranged against the BJP in this election while caste fault lines — Gurjar-versus-Meena, Jat-versus-Gurjars and Jat-versus-Rajputs — which favoured the BJP in the last election appeared to be losing their sharp edges this time. The Rashtriya Swayamsevak Sangh, the BJP’s ideological parent that has been the party’s bedrock, was indifferent, at best. So were sections of BJP workers who saw Raje having a showdown with BJP national president Amit Shah over the latter’s choice of the state unit president. In contrast with her falling popularity, Modi seemed to still inspire confidence in the people and that explained the impressive gatherings at his rallies in the state. Although there was an element of unease among the unemployed and those at the receiving end of the farm crisis over the Centre’s failure to intervene, people largely sounded positive about Modi or were ready to give him the benefit of doubt as they put the blame at the chief minister’s doorstep. Anxious to overcome prevalent resentment against the Raje regime, the BJP seemed to explore communal fault lines but that narrative did not seem to change the electoral discourse despite Shah, Uttar Pradesh Chief Minister Yogi Adityanath and many other leaders making provocative speeches on their campaign trails. Despite the odds against it, the BJP was banking on Modi’s popularity and favourable swings of the ‘X’ factors for a dramatic turnaround in its fortune. Although both the BJP and the Congress faced rebellion, the saffron party banked on the strength of the opposition party rebels to spoil its chances on many seats. There were at least half-a-dozen seats on which Congress rebels were considered “very strong” even by opposition leaders, while they were seen as “possible spoil sports” on about a dozen other seats. The Congress was hoping to gain from resentment among Jats against the BJP regime but the emergence of Hanuman Beniwal, a former BJP legislator, as a rallying point for the community seemed to neutralise these gains. Beniwal floated the Rashtriya Loktantrik Party and fielded its candidates on 57 seats. Like Ajit Jogi and Mayawati in Chhattisgarh, Beniwal could turn out to be an X factor in Shekhawati region comprising 39 seats. Similarly, the Bharatiya Tribal Party of Chhotubhai Vasava fielded candidates on 11 seats, disturbing the poll calculations of the two main parties in the tribal districts of south Rajasthan. The Congress did not announce its chief ministerial candidate in Rajasthan and it was expected to trigger an internecine battle in the opposition party. But the two contenders — state Congress chief Sachin Pilot and former chief minister Ashok Gehlot — seemed to have worked in unison once the campaign started. Congress president Rahul Gandhi who campaigned extensively in Rajasthan may have a difficult choice to make if the party were to romp home on December 11 when results will be announced. Veterans have been lobbying for Gehlot but Gandhi would find it difficult to ignore the claims of a young leader who left his family in Delhi five years ago to permanently camp in Jaipur and keep the party on the constant agitation mode.